Hi there! I hope everyone had a wonderful Christmas! We sure did over here! I am still having so much fun testing out my new instant pot. Just over the past week I have made Mongolian Beef, Mississippi Coke Roast, Chili Con Queso, Baked Potatoes and I finally tried PASTA in it!!! I am a teeny tiny bit picky about cooking dried pasta in with my sauce, so I wanted to try and use the refrigerated Tortellini for my first go ’round. It was a huge, huge hit. One of my favorite parts of the instant pot, is the ability to brown/saute in the same pot before you pressure cook. This has cut down on the amount of dishes I have to wash big time. This recipe couldn’t be any easier, brown the sausage, add the noodles and sauce and spinach, and pressure cook for 5 minutes, top with cheese and dinner is DONE! It’s like magic! 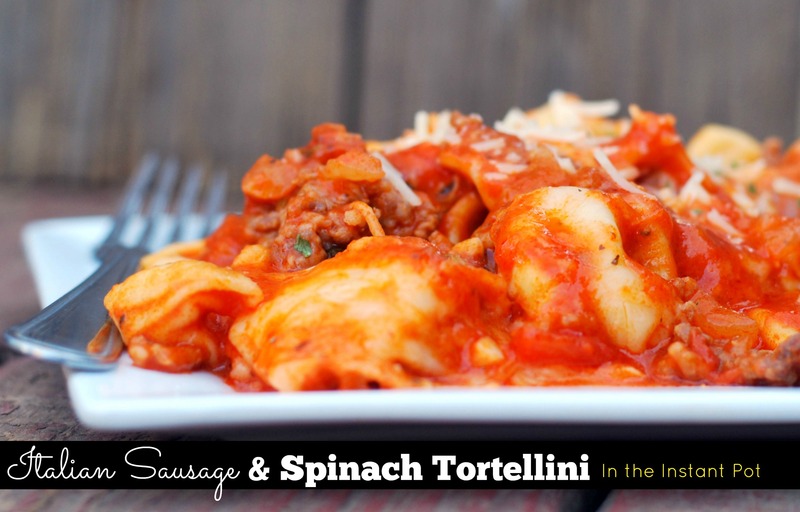 Click here for an easy skillet version! Click here for our FAVORITE Easy Instant Pot Recipes! Plug in pot and set to saute' function on high. Once hot, add oil, onions and sausage. Brown sausage and add garlic the last minute. Layer tortellini, marinara and water. Top with spinach and don't stir. Set pot to manual pressure and the timer for 5 minutes. Quick release and add salt and crushed red pepper. Stir and top with lots of Mozzarella and Parmesan cheese and cover for a couple of minutes, or until cheese is melted. Serve and enjoy!